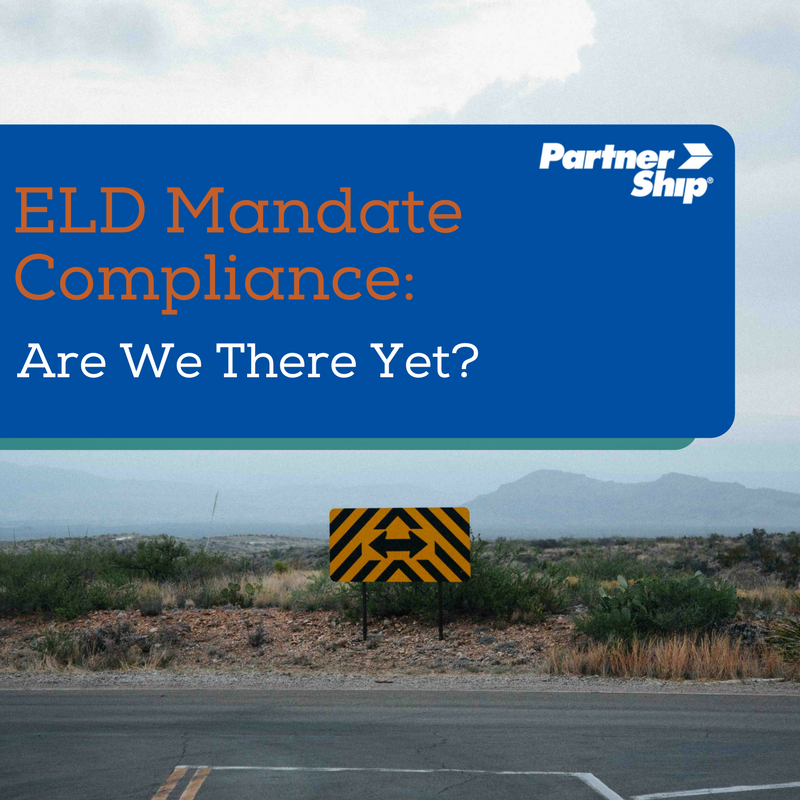 ELD Enforcement: Are We There Yet? It's been just over a month since the "soft enforcement period" has ended for ELD regulation, and while the shipping industry is seeing huge improvements with compliance, there are still a number of challenges facing shippers. While most of the crunch was felt at beginning of the year, when the initial ELD deadline went into effect, it's going to take some time before we see the industry normalize. As we head into the summer and a heavier shipping season, what can shippers and carriers expect to encounter along the way? According to several reports, it appears that the majority of carriers are now using electronic logging devices to track their hours of service, with as many as 95% becoming ELD compliant. While many small carriers originally insisted that they would not comply and figured it was time to make their exit, the capacity crunch and need for experienced drivers has boosted the trucker's market, outweighing the inconvenience of switching over. According to a DAT Solutions survey, over 60% of these carriers have added the compliant devices within the past three months, following the deadline date. Survey respondents are, however, confessing that the ELD mandate has a huge impact on day-to-day business, with 87% reporting that the mandate is changing the way they prioritize loads. The most significant factor impacting carriers? A significant increase in detention time – basically any time taking over the given 2 hours. Many shippers fail to recognize that time for loading/unloading freight counts as active "on duty" hours for the driver. The strict HOS (Hours of Service) rules can decrease an already limited amount of hours available for transit time.The good news is, with trucker time being more accurately logged, drivers can now prove exactly how long they were held up during loading. Carriers then have leverage to choose precisely who they want to ship with, and determine who may create problems for them on future loads. While this creates a positive environment for truck drivers, it can leave shippers in the backseat. But don't fret, there are several things shippers can do in order to to create appealing loads for carriers, which we will get into a bit later. The data taken from the ELD devices can actually help shine some light on existing safety issues within a fleet. Predictive modeling can determine safety concerns that may arise in the future, such as probability a truck may be involved in a roadside accident. By looking at historical data, it will be easier to determine potentially dangerous routes, trucking equipment, hours of operation, and operators. So far, utilizing data in order to better determine areas of opportunity for increased driving safety is the most positive application of the new mandatory ELD technology. So what's to come? As expected, with drivers spending less time at the wheel in one run, transit times will continue to lengthen. This means that drivers have to take less loads per week as well, with 67% stating that they drive fewer miles than they did before the devices. Parking space is in a crunch as well, with more trucks spending mandatory rest breaks at stops. This is also related to yard congestion, or several trucks arriving on time for delivery within a small window. Proper warehousing protocol and smooth receiving and loading procedures is crucial. It may be a good idea for shippers to extend their warehouse hours to offset the congestion. Having properly staged freight ready and waiting with an adequately sized team can also help decrease time spent at the loading dock, freeing up hours available for your driver to be on the road. Another option for shippers is to consider drop trailer freight programs. A carrier will haul a tractor to a shipper's loading dock and pick up a previously loaded and left behind trailer. This can increase efficiency by decreasing detention time and likelihood of deadhead. One thing is clear: the initial push-back from owner-operators to make changes in order to become ELD compliant has mostly disappeared. Those originally looking to leave the industry are adapting to new policies and procedures, but there is still a significant learning curve. The biggest take-away is the impact of detention time and a newly invigorated intolerance for running into overtime. Drivers are vigilant, and shippers need to be even more prepared for a smooth and quick load time. PartnerShip can help businesses manage LTL freight moves and connect you with vetted, reliable truckload carriers. Stay competitive and ship smarter with PartnerShip – get a quote today!